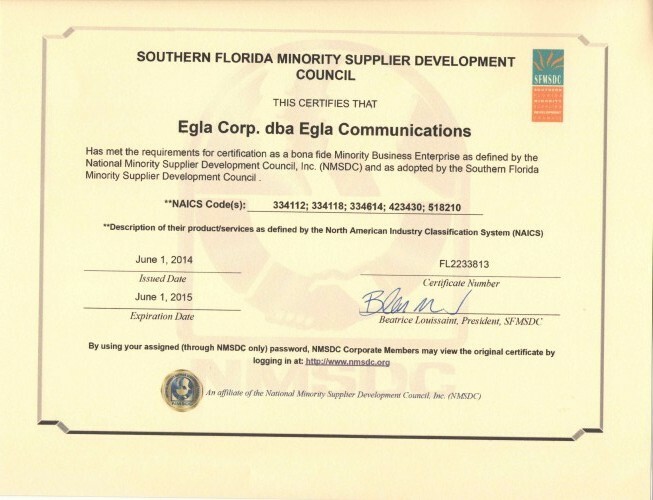 EGLA COMMUNICATIONS has been certified as a “Minority Business Enterprise” by the Southern Florida Minority Business Council. As part of these efforts, EGLA is now able to participate in many programs and be part of corporate/government diversity opportunities. EGLA’s high technology offering will come in hand to serve our country in several ways. 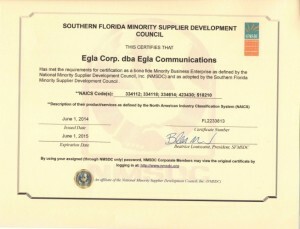 As part of this process, EGLA is also a vendor for several organizations including “Broward College” and many others. EGLA is registered with SAM.gov, and many other online platforms for federal biddings.